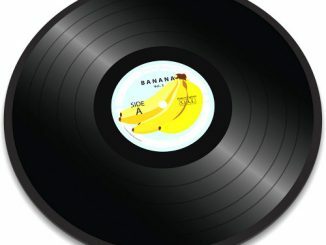 Want to freak out someone who’s big-time into vinyl records? 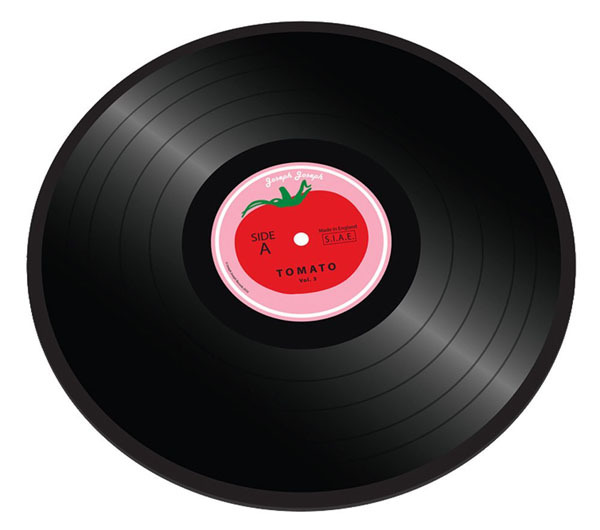 Start chopping up veggies on top of this Worktop Saver Tomato Vinyl Chopping Board. After the shock and awe, and laughter, you can explain that this is one record that’s hard to break. 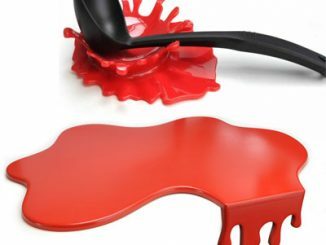 You can even stick it in the dishwasher. 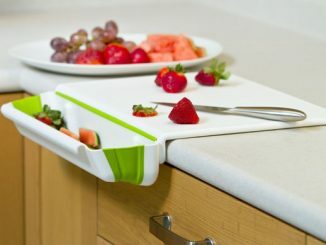 The Worktop Saver is made from toughened glass which is virtually indestructible, and it will provide a hygienic, odor and stain free work surface. 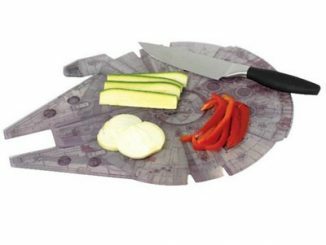 It’s really versatile and can be used in a number of different ways: as a chopping board to prepare food, a serving board for cheese or to protect your work surface from heat marks. 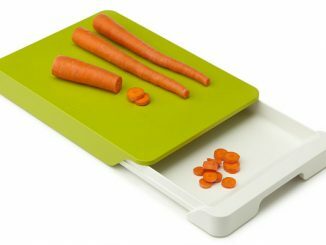 On the underside of the board there are non-slip rubber feet which are designed to keep the board safe and secure on your table or worktop. 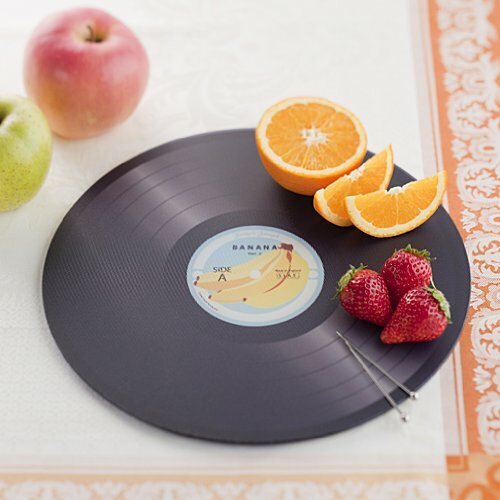 This vinyl shaped Worktop Saver is perfect for those who love their retro music and cooking. 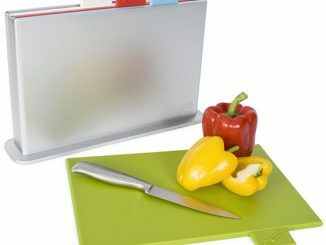 – A.D.
Every cook needs a good chopping board, so why not get one that begs to have a little fun? 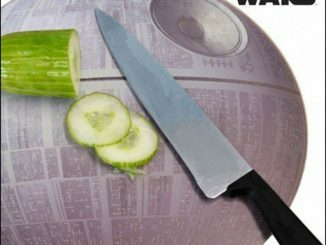 Make music with your knife as you chop up your tomatoes and tomahtoes. 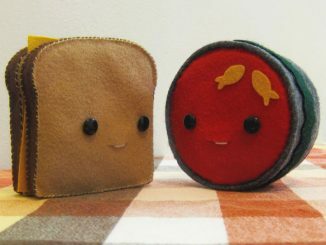 Keep it out in the open and use it as punchy, retro kitchen decor. 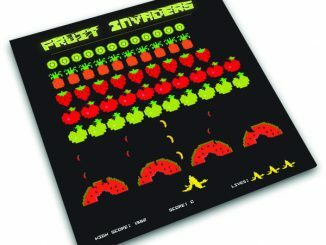 The Worktop Saver Tomato Vinyl Chopping Board is £14.99 and freshly available at I Want One of Those, and you can also find it for $24.99 at Amazon and with a Banana instead of tomato. 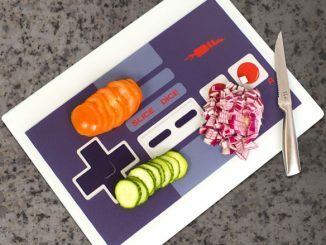 You may love these chopping boards, too: The Fruit Invaders Chopping Board, Gamepad Chopping Board, and Index Chopping Boards. 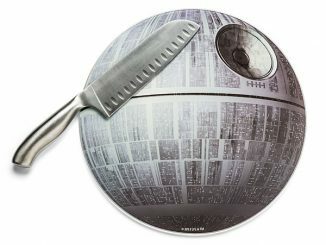 I don’t think you’d even need to be heavily into records to be freaked out by this! 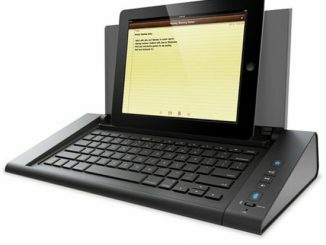 I can’t see myself being able to use one of them without a “fingernails on chalkboard” type reaction. The fragility of vinyl is far too ingrained for me to be able to be so reckless!